Michelle, I hear you!! As soon as I saw the beast, I managed not to faint and took the kids out despite it was their nap time... I then told my husband, it's me or the spider LOL!!! I left until someone came to collect it Snowlord, I, too, wish you all the best with that.... OMG!! The odor they emit dispels harsh entities within a room. Why did i look? Just why! I wouldn't mind being in the same room as one. I once drove around town with a spider in the car and didn't notice until I was parked. I think it would be cool to own a large spider. 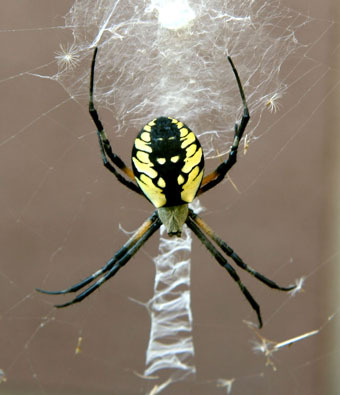 I have the Argiope aurantia in my yard every year. They are the spiders that Charlotte, from Charlotte's Web, was based on. Edited by MacCionoadha' Bean-Sidhe, 07 April 2016 - 02:45 PM. I want a Charlotte's web spider! .... that would be cool to have one in the yard. My best friends little brother had one of these https://en.wikipedia..._tarantula The first time I went to my friends house back in high school, his lil brother was laying on the couch without a shirt on and had his tarantula on his stomach and he was patting it.......HELL NO! 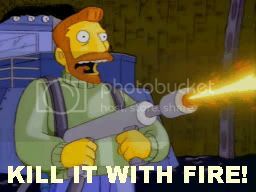 I don't really mind spiders but even I have a limit... nope! I want one too, i'll call him fred. A very pretty creature... from a distance! Snowlord - love the pics, so colourful! As a teenager I worked in an exotic pet shop and other employees would often have me care for the "creepy" animals' since they didn't bother me as much. They had an adult tarantula named Harry who never sold and eventually became a kind of shop mascot. He was quite tame, sweet and friendly. When I put my hand in the cage he'd run up my arm, sit on my shoulders and wave his mandibles around to "beg" for crickets. He was pretty shy with everyone else but seemed to recognize me since I fed him daily. This and other encounters with spiders have made me more interested in these beautiful and mysterious animals and suspect they're far more intelligent—or at least aware of their surroundings—than we give them credit for. Wow, that's some video on the website, Siguie... I want one just to play with.